This chapter will locate debates around MOOCs within a discussion on the purposes of higher education for professional learning and trends for trans-disciplinary approaches in designs for networked learning. The authors revisit the meaning of a ‘higher' education in contemporary tertiary contexts and within professional learning degrees and also examine the types of expertise required when designing for and facilitating learning in a MOOC open-style environment. In response to these aims, they offer a trans-disciplinary framework (Wadsworth, 2010) drawn from complex systems thinking in health, community and human services, to assist our enquiry into educational innovation. The authors suggest that a more nuanced understanding of the types of expertise required by those involved in macro-level learning occurring in MOOCs will lead towards a greater role in creating the next generation of multi-professional experts. They draw from the learning sciences, epistemologies on ways of being and becoming, and innovations with educational technologies. 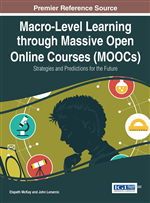 The emergence of the massive open online course (MOOC) has been rapid and attracted great attention. The benefits of these open and online courses were their potential capacity to deliver high-quality education from the best institutions and instructors to very large groups of people, predominantly free of charge. The promise was that these courses would democratise higher education and make knowledge accessible and freely available to the world. Despite these earnest aims, it would appear that the promise has not yet been fulfilled as was intended, and more expertise in multidisciplinary innovation may be required in the future. Significant challenges have befallen initial and early MOOC providers and many questions have been raised about the quality and sustainability of these offerings, the ability of them to work across the spectrum of knowledge domains including a variety of educational institutions (e.g. universities, TAFE and vocational sectors, private providers and groups offering continuing professional development), and their efficacy against more traditional forms of technology-enabled learning and teaching. In addition to the broader issues associated with MOOCs themselves, the rise of the MOOC has created distinctive challenges for university management and academics when designing for quality learning and teaching in higher education. We concur with Siemens (2013) that the MOOC phenomenon is representative of more entrenched underlying pedagogical and epistemological issues in higher education, and a response to consumer/public needs for flexible adult learning options. As he puts it “MOOCs appear to be as much about the collective grasping of universities’ leaders to bring higher education into the digital age as they are about a particular method of teaching” (p. 5). Although some of these challenges are akin to previous waves of technological change in higher education, in particular since the Internet became widely available (Garrison & Vaughan, 2008), there are some specific issues with MOOCs that are worthy of additional discussion. Furthermore, the fallout from the debate about MOOCs is that the contentious issues may be symptomatic of a deeper crisis around the meaning of a ‘higher’ education in the digital age and the changing nature of ‘expertise’ both calling for collaborative and trans-disciplinary approaches. Within this context, our chapter will include an exploration of what large, open courses may mean for the development of expertise in practice-based or professionally oriented disciplines where propositional (practice) knowledge, ways of being (becoming) and work-integrated learning (WIL) predominate. Dall’Alba and Barnacle (2007), and Barnett (2009) argue that the development of expertise and disciplinary ways of being are the ultimate aims of higher education. It is these aims that will form the basis for our analysis of the MOOC phenomenon and its relationship to policy making in higher education. In exploring these aims, we offer three main themes: firstly, the changing nature of expertise and its development; secondly, the way we may view learning theories and pedagogical approaches supporting expert and professional development, and finally, the needs of academics and educational designers to enhance student learning in increasingly specialised ICT mediated environments.